The ATSC-SDI 4 tunes ATSC off-air, clear QAM cable, analog channels, and MPEG-4 and MPEG-2. Other features include the ability to deliver 1080P video, and easier firmware updating to ensure that your tuner is always up to date with the latest software. It also includes an HD-SDI output, The HD-SDI port outputs the tuned program with captioning and V-Chip data scaled to a set resolution up to 1080p. Control options include Ethernet, RS-232, USB and IR, and remotely from an on-board Web page. Setup is simple with its text menus on the front-panel LCD display. The tuner displays broadcasts through simultaneous HDMI and NTSC composite video, and can even switch between Component or RGBHV outputs. Full-time audio is available from Dolby 5.1/PCM digital HDMI, optical, and coax ports, as well as variable-level analog stereo audio outputs. The integral HD-SDI output allows inclusion of 708/608 captioning, choice of AES stereo or AC-3 audio, and scaled output set to a constant 1080p, 1080i, 720p, or 480i resolution. 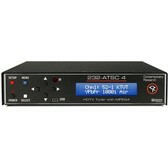 A professional HDTV tuner, the ATSC-SDI 4 features onboard Web pages for control, setup and monitoring. The compact enclosure allows mounting of two tuners in a single rack space.